Display plinths and counters are one of the best ways to display your products at different heights. By creating a display which represents your product or your artwork, each with their own separate stand, you can make it look more attractive and visible to your audience. These display plinth systems have been designed to complement your product and with the steel shelf which fixes perfectly to the top of the plinth, you have a sturdy platform to do so. With a load capacity of 15kg, our display plinths and counters are manufactured for build and quality. 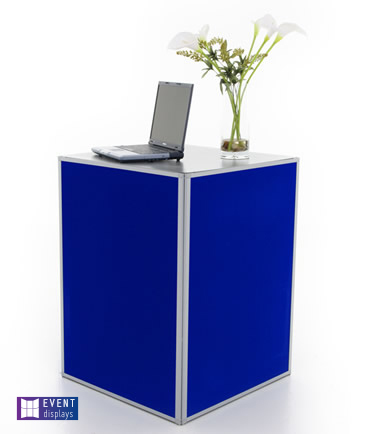 Our plinths are easy to assemble and dismantle too, which means you can be the first to set up and the first to be ready to go home after an event or exhibition. This is one of the most cost-effective ways of creating a promotion display that is both great quality and portable. With a five-year hardware guarantee, you can invest in a product which lasts and maintains its quality regardless of how many events you attend. We manufacture our products ourselves so if you have any bespoke requirements, contact us to see how we can help.